It feels as though we have been bombarded with tragedy after tragedy. From natural disasters affecting individuals in Texas, Puerto Rico, Florida, and Mexico to a mass shooting in Las Vegas claiming the lives of 59 people and injuring over 500. The heaviness and heartbreak pouring in can be overwhelming. You may find yourself experiencing a range of emotions from disbelief, anger, sadness, grief, hypervigilance, helplessness, and fear. We are exposed to videos and stories flooding in that leave us vulnerable and at times unsure of what to do with the enormity of our feelings and desire for this to never happen again. For those who are highly sensitive and tend to absorb and experience these emotions on a deep and complex level it can become increasingly more difficult to go about day to day living. Not everyone experiences or copes with tragedy the same way. Some become numb or desensitized. Others are able to separate themselves from the tragedy and don’t feel as affected. Sensitivity, is a wonderful trait. It allows you to be attuned to others experiences, to display genuine empathy and compassion when there is pain and suffering. Sensitivity can also takes it toll on your own emotional health when your not paying attention. Take care of yourself as you continue to bear witness to the stories of those directly impacted by this tragedy. I encourage you to not stuff, hide, or try to run away from these feelings. I encourage you to find a safe space, a trusted friend or professional to share your experience with. Staying connected to others is vital in helping you cope. As humans, we are hardwired for connection. We need to feel heard and supported when we are in pain. It is absolutely okay, and at times even necessary, to limit how much news content you are watching or reading. I encourage you to find the right balance of how much news content you can absorb to stay informed without feeling overwhelmed. Unplugging and spending time in nature or with loved ones (including the furry pets) may also be extremely helpful. Traumatic events have a way of instilling helplessness. Fueling “how can I make a difference, I am one person”. You can make a HUGE difference because you are one person. Take action that aligns with your beliefs and principles. Your voice is powerful and meaningful. Use it. Call your representatives. Get involved in non-profits and organizations that believe in fighting for change that you believe in. If you are struggling as a highly sensitive person Mindfulness based therapy can be beneficial in supporting you. 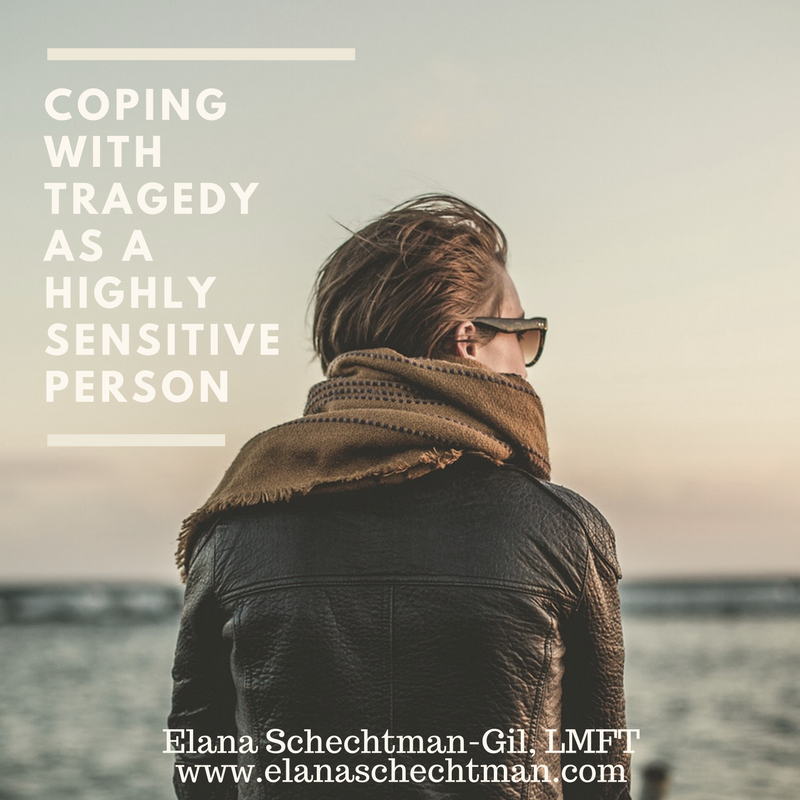 Schedule a consultation to see if Elana may be a good fit as your therapist.